PoE security cameras are wired over both Cat 5 and Cat 6 Ethernet cables and usually routed to a home network router or an NVR. They are very network efficient and cost effective, as well as being relatively easy to install. They typically only require one cord and draw power from the Ethernet cable which saves a lot of time when you’re installing. 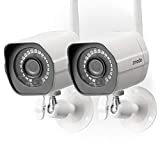 Analog wired security cameras will have a separate power cord which means you will have to hard wire it into the wall or find a convenient power outlet. Having all of your Ethernet cables run to a central location like an NVR gives you a single power source for all of your cameras. This makes it very easy to put your entire camera network on a battery backup, keeping your entire surveillance system running even when the power is off. Since PoE cameras all use the same general type of camera, you won’t have to re-wire your entire surveillance system if you plan on installing new cameras. You can simply plug in the new cameras where your old cameras were. And since they are hard wired to one location which usually interprets the live feed, you won’t have a huge negative drag on your network like you would with cameras that broadcast over a wireless network. Since they have a relatively low impact on your network, you can also scale up your surveillance infrastructure easily. Generally, you won’t need more than one NVR for a typical home surveillance network, but if you do, you can just add an additional PoE switch to your network. If you were running your camera over a wireless network however, then you might be forced to upgrade your entire network at some point. Since all of your cameras are powered from one centralized location you’re always going to be at risk of all of your cameras going down all at once. On the bright side, if all of your cameras do go down, then at least you know what the problem is and it can be fixed relatively easily. There is a limit to how far away your camera can be from its power source. If you’re comparing them to WiFi cameras, then PoE are the hands down winner in distance, but you do have a limit of 100 yards. When you first connect a powered device to an Ethernet port, that switch will use a form of detection to determine if the device is actually connected to the port or not. This routine is initialized only when your first plug-in a device into the port. So when you plug in a non-powered device into a port, your device will turn off detection. This can cause a lot of headaches because your PoE router will generally only send power once a powered-device is detected, but your detection has been turned off because you plugged in a non-powered device into the PoE port. One of the major drawbacks to using these types of cameras is that they usually require some technical skill to set up properly. Networking cameras can always be a little tricky, but they do have easier wireless solutions available now. Though even with those, if you don’t have a powerful enough modem you might experience video delays and other issues. They also have the potential to suffer from network delays and interruptions. If you’re worried about setting up your security cameras and you think it might be a little over your head, you might want to consider getting professional cameras installed. You can get a free quote with Protect America and ask them about their security cameras. It’s always a good idea to talk with a home security professional before making decisions on how you’d like to secure your residence or office. A company also allows you to have monitored security, which is much safer than a stand-alone system. While you are likely super diligent, there’s no substitute for having a second set of eyes on your property. If you’re ready to take the leap towards a more secure life, talk to Protect America Home Security for a free quote today.